What immediately comes to mind for me is the 4th of July (also known as Independence Day). There are plenty of parades, picnics, fireworks, and other events to celebrate the day. But why are we celebrating it? July 4th has been a federal holiday in the United States since 1941, but the tradition of Independence Day celebrations goes back to the 18th century and the American Revolution (1775-83). 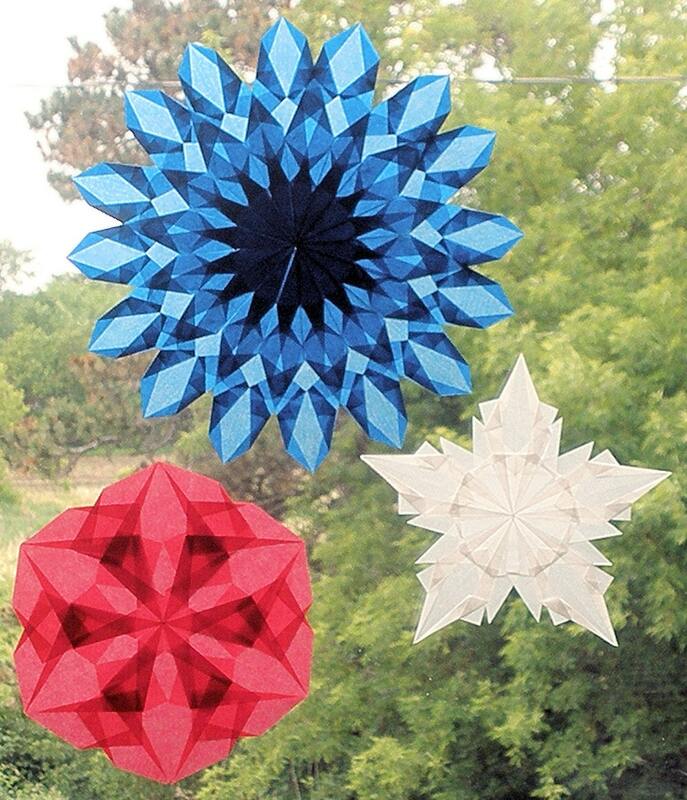 What are some ways to create a festive environment at home to celebrate the 4th of July? This year, I made some red, white, and blue buntings to decorate the home and yard. I made some extra ones that are available in my shop, Harvest Moon by Hand. available at Harvest Moon by Hand. In a past issue of Home Companion magazine, there was a picture of a table runner made from kraft paper that had flowers and circles cut from decorative paper sewn on with red thread. I thought it would be nice to have something special for the table that is a bit more permanent. So, I picked out tan linen fabric, red thread, fabric in red, white, and blue patterns. I cut out different sizes of circles and then sewed them randomly onto the fabric. After that, I hand-embroidered each circle onto the fabric using the blanket-stitch. My daughters and I made this centerpiece by making origami cranes from scrapbooking paper, and punching circles from red, white, and blue scrapbooking paper. 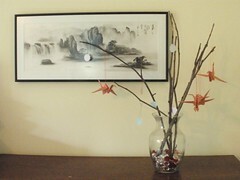 We hung the cranes and circles on branches that were placed in a vase. There are red and white glass pieces at the bottom of the vase. red, white, and blue paper ornaments. I also like to decorate with red, white, and blue window stars. There are many different patterns available at Harvest Moon by Hand including the trio of stars below. I love your table runner! You are so talented. The red white and blue star combo set is excellent! You and your family are so talented! I love to see how you live handmade. The window stars are works of art. Stopping by your blog is such a joy. Your ideas are fabulous and I love how you integrate your creativity into your home and into the lives of your children. Your table runner is fabulous and the buntings are so festive! Wow! You have really created some cool items! Love them. Happy 4th of July! I always enjoy your stars…they look so complex. The RWB origami is a great idea too.